Port Bay area fishing: Argo Charters has been providing quality sport fishing opportunities to anglers for over 20 years. We offer single and multiple day packages; we also have the ability to put together multiple boat and corporate packages with lodging. We operate out of Port Bay, which is on the south shore of Lake Ontario, thirty five minutes northwest of Syracuse and about the same distance east of Rochester, NY. Typically we are on the water for 6 or 8 hours, but other time frames can be arranged. We support catch and release. However, we do not attempt to release wounded or bleeding fish. We use the lightest tackle possible based on the type of fish and fishing conditions; generally 6-8 lb test in the Spring, and 15 lb test for salmon. WE HAVE UPGRADED OUR BOAT!!! 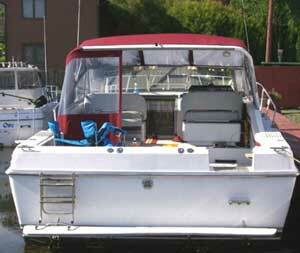 The BV EXPRESS VI is a 33' Trojan 10 Meter 13' wide for much more stability and comfort when out on the big lake. It is equipped with Plotter, GPS, depth finder, radar, vhf radios, stereo,electric planer retrievers, temp & speed, both surface and at depth. Scotty downriggers and the latest in rods, reels and lures. The Penn Yan has given us great service over the past 20 years. We felt that it was time to step up to a larger boat to stay competitive. We hope that you'll enjoy her as much as we do! Your Captain is a full time USCG Licensed captain. 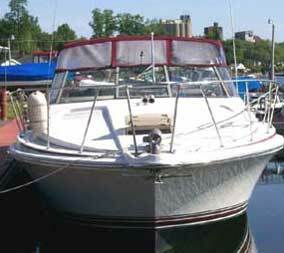 He is fully insured and has over 30 years experience fishing and navigating Lake Ontario. Port Bay Marina offers camping and lodging right near the dock. A mate is always on board to assist the Captain in making your day as pleasurable and productive as possible. The First Mate will clean and ice down your fish for you. Complete charters and lodging packages available click here. Lodgings facilities have heat, air-conditioning, Cable TV, housekeeping, and just steps away from the dock. 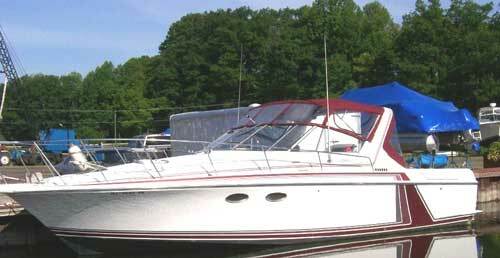 We also provide a 14 foot boat for your use at no extra charge. For your convenience we gladly accept Visa and MasterCard. Contact us to make your reservation now!! Hosting by BlueEye Design Co. | Port Bay Marina is a trusted member of Lake Ontario United.